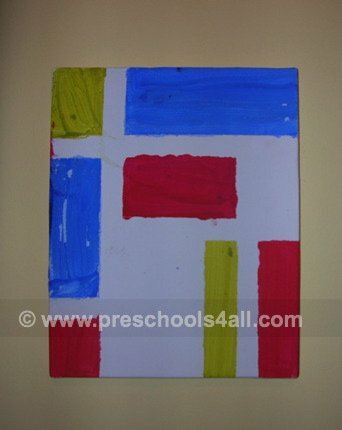 Children painting can reflect their interests in other objects and materials around them. 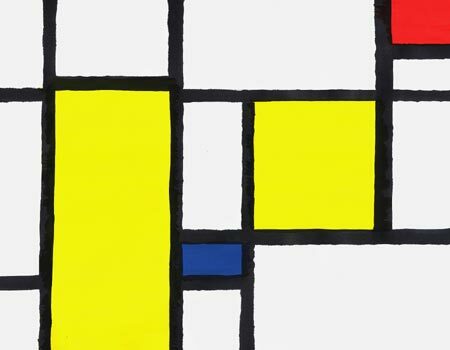 Today we shall make use of tape and string to create modern art inspired by Piet Mondrian. This activity was done in my son's class and it was inspired by the children's love for tape. 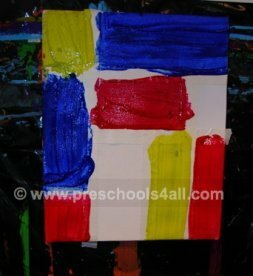 The group simply loved using tape, so the teachers decided to direct the children's interest to create art inspired by Piet Mondrian. You can see the wonderful result below. 3 years old and up, takes about 20 minutes and watch out it gets messy! 1. Put tape on the canvas. 2. Paint in one of the primary colors. 4. Put the tape in a different location. 5. Paint in another primary color. 7. Put the tape in a different location. 8. Paint with the third and final primary color. This paint splatter activity helps develop creativity and sensory. Be ware! It gets messy! By using a string as a painting tool instead of a paint brush, children have more freedom to move their wrists in a circular direction. This is another great fine motor activity. I recommend that you place the paper on a table and not on an easel.